Yet another enjoyable entry in the Comoran Strike detective series, with so many worthy suspects you’ll keep changing your mind about whodunit. Overlapping plots and schemes add a welcome complexity to the traditional detective genre. The continuing saga of the relationship (or lack thereof) between Strike and his partner Robin Ellacott is a nice touch as well. 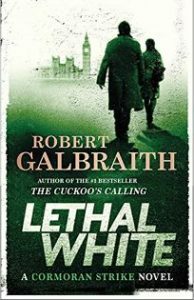 J. K. Rowling, under the pen name Robert Galbraith, continues this highly readable detective series with style and panache. She portrays Cormoran Strike as a burly, scowling, aloof man in near constant pain due to the pressures of his prosthetic leg. Yet his underlying humanity comes through loud and clear, endearing him to readers as well as various ladies in the series. Robin Ellacott is an equally interesting character, with natural detecting instincts but a lack of experience that sometimes gets her into trouble. By setting this mystery in the middle of London’s hosting of the Olympics and Paralympics, Rowling/Galbraith also gets to involve radical left and anarchist characters as a contrast to the government ministers planning the big event while also scheming against each other. It’s a big cast and you can almost imagine the multiple lengths of red yarn connecting them all on a complicated investigation board. There’s a lot to keep straight but this mystery is worth the effort. Billy, an obviously mentally disturbed young man, bursts into Strike’s office insisting that as a child he saw a murder. Almost immediately Strike is asked to stop both a blackmailer and a rival politician from attacking Jasper Chiswell, the Minister of Culture and a Member of Parliament. In a coincidence worthy of Dickens, these two cases have a connection. For more about Robert Galbraith and her/his books, click here.